Dietary fats are crucial to your dog’s health in many ways; they are a valuable source of energy, support healthy cell function and hormone production, help protect against disease and inflammation, and allow the absorption of fat soluble vitamins A, E, D and K. Fats also have an important impact on the dog’s brain health and behaviour. But how much fat should you be giving your dog for optimal health and does it matter what type of fats you feed him? Does fat make your dog fat? And what’s the big deal about coconut oil – should you be adding that to your dog’s food? I’d love to give you a nice simple answer to those questions, but after doing some quite extensive and fascinating research recently into the world of fats, the more appropriate response is…..it depends! If you want to ensure you are providing your dog with the critical levels and types of fats that will optimise his health, it is really worth taking a bit of a delve into understanding some of the finer details of lipids. How much fat your dog needs depends on a number of factors including stage of growth and life, energy needs, metabolism and whether he suffers from health conditions. (and for cats and kittens, 9% crude fat) . AAFCO do not give maximum amounts of fat, these are just minimums so it is hard to say what is optimal. Another way fats levels are recommended is by percentage of energy in the food. The National Research Council (NRC), which AAFCO base its nutritional guidelines on, suggests a minimum of 13.75 grams of fat (per 1000kcal of metabolizable energy – ME) for adults and 21.25 grams for puppies. For the average pet owner I imagine that sounds like a lot of blah, blah, blah, blah! So what on earth does that mean for what you are feeding your dog or cat you may well ask! 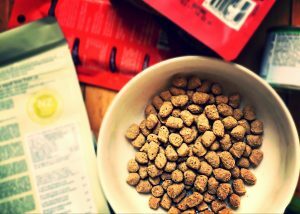 If you’re feeding a commercial food for your pet, then reading my article on pet food labels will help you determine whether the food you’re giving is at least meeting these minimum standards – so at this stage it might help you to read my article on how to interpret pet food labels – here’s the link). But if you’re making your own pet’s meals or at least want to know if the type of fats in the commercial food you are buying are best for your dog, then we need to dig a little deeper and understand the types and balance of fats we give our pets. Does fat make your dog fat? Fats are an energy dense food – they contain more kilocalories per gram than either protein or carbohydrates. But broadly speaking, they are used much more efficiently as an energy source by dogs, particularly compared with carbohydrates. This is a whole topic in itself to explore, but in short, a good balance of fats relative to your dog’s life-stage and activity level will actually help keep your dog lean. But there will be a point where too much will contribute to weight gain, particularly if served with starchy carbohydrates. Fats are part of a group of compounds called lipids. The are insoluble in water but dissolve with solvents, and can be categorised as either simple, compound or derived lipids…..the ones we most frequently focus on for our dog’s diet are the simple lipids, particularly the triglycerides. Triglycerides are made up of different types of fatty acid chains, which are formed from atoms including hydrogen, oxygen and carbon bound together in various configurations; it is the structure of these atoms that helps to determine the nature of the fatty acid, which is useful to know because it affects how your dog (or any animal for that matter) will use those fats in the body. The fatty acids are classified generally by the level of ‘saturation’, which refers to the degree of hydrogen atoms bonded to carbon (these are called carbon bonds). Another way fats are identified is by the length of the fatty acid chain (short, medium or long) for example, you may have heard about the benefits of coconut oil that result from its qualities as a ‘medium-chain fatty acid’. Saturated fats: Carbon bonds in the fatty acids are full with hydrogen, making them very stable – less likely to go rancid when exposed to air, light or heat. Usually solid at room temperature because of their structure and are mainly found in warm blooded animals and tropical plants (like coconut). Saturated fats have had a reputation as nasty fats to be avoided at all costs for humans. More recent research suggests a balance of some saturated fats (particularly medium chain fats) offer a range of health benefits in humans. For dogs and cats, there is less concern because of how they are used in the body; they are a good source of energy and help regulate temperature, growth and reproduction. Monounsaturated fats (MUFA): Fatty acid chains miss two hydrogen atoms and instead have two double bonds. Not as stable as the saturated fats, but more stable than than polyunsaturated. Usually liquid at room temperature – think of olive and nut oils. As with saturated fats, they can facilitate digestion and absorption of fat soluble vitamins in the gastrointestinal tract. Polyunsaturated fats (PUFA): Missing four or more hydrogen atoms so have two or more double bonds. This makes their structure very fragile and as a result they are more prone to oxidation and damage from heat and light. Includes essential fatty acids (EFAs) for dogs; these are fats that the body is unable to make from other nutrients in the body so they must be sourced from the diet. Dogs have five essential fatty acids, which are further categorised into Omega 3 and Omega 6 fats. 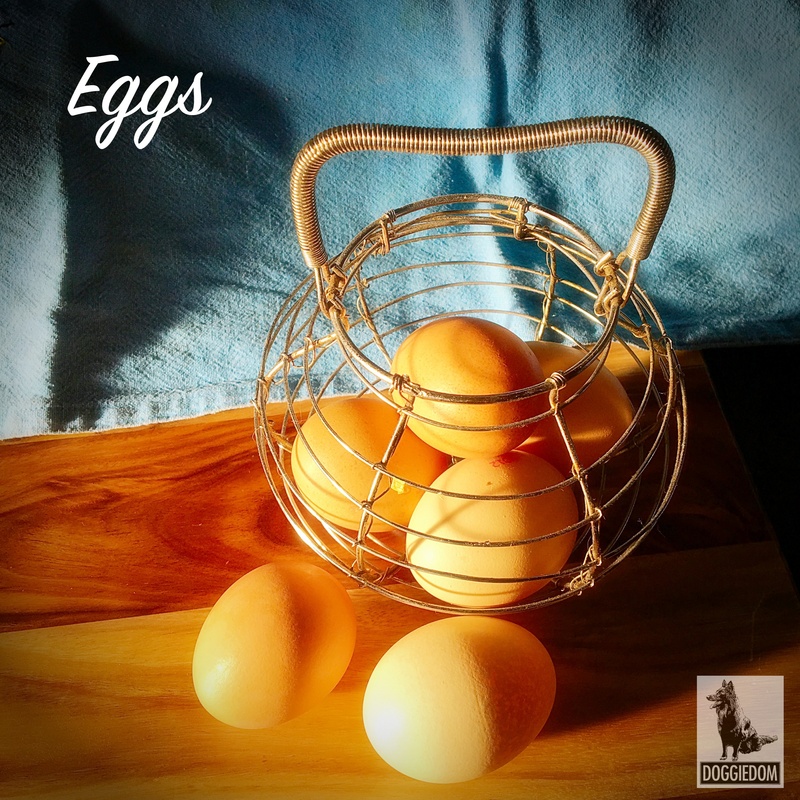 The EFAs are generally only needed in much smaller amounts. They play an important role in reducing inflammation and protecting against disease. A deficiency or imbalance of these fats can lead to a number of health issues, usually most evident on the dog’s skin. Your dog will benefit from having all these types of fat in her diet, but as with most things in life, finding the right balance will help you achieve better health for your dog. One of the most important things I’ve discovered in my fat fact finding venture is how the proportion of fat in your dog’s meals can have a significant influence over the amount of protein and other nutrients your dog is will absorb. For example, according to Steve Brown (2010), a 10% difference in the leanness of beef can mean a 42% decrease in protein for your dog with a 36% increase in fat consumed! That’s quite significant. 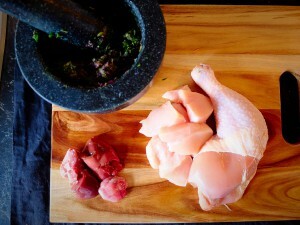 This is far removed from the protein and fat profile that Brown considers optimal for dogs based on their ancestral diet. Because critical trace minerals are actually in the meat, not the fat, these fattier cuts of meats can also significantly affect levels of iron, manganese, copper and zinc. So just by adding fattier meats to your dog’s meal, you could unwittingly be feeding a diet that may not be meeting his minimal nutritional needs. Many pet guardians can unknowingly create further problems by indiscriminately adding supplementary fats to these meals because they have been told they offer health benefits – this could be anything from coconut oils, fish oils or vegetable-based oils. Besides adding to the total fat content, it can throw out the balance of fatty acid types, particularly those important EFAs. Most nutrition experts agree that there is an optimal ratio of dietary Omega 6 to 3 fatty acids for healthy body function; the exact ratio though is a topic of much debate….I’ve seen ranges anywhere between 15:1 to as low as 2:1. So where does that leave us? Through my own research, I tend to work on a ratio ranging on the lower scale of Omega 6: 3 of around 4:1, with some meals up to around 8:1. 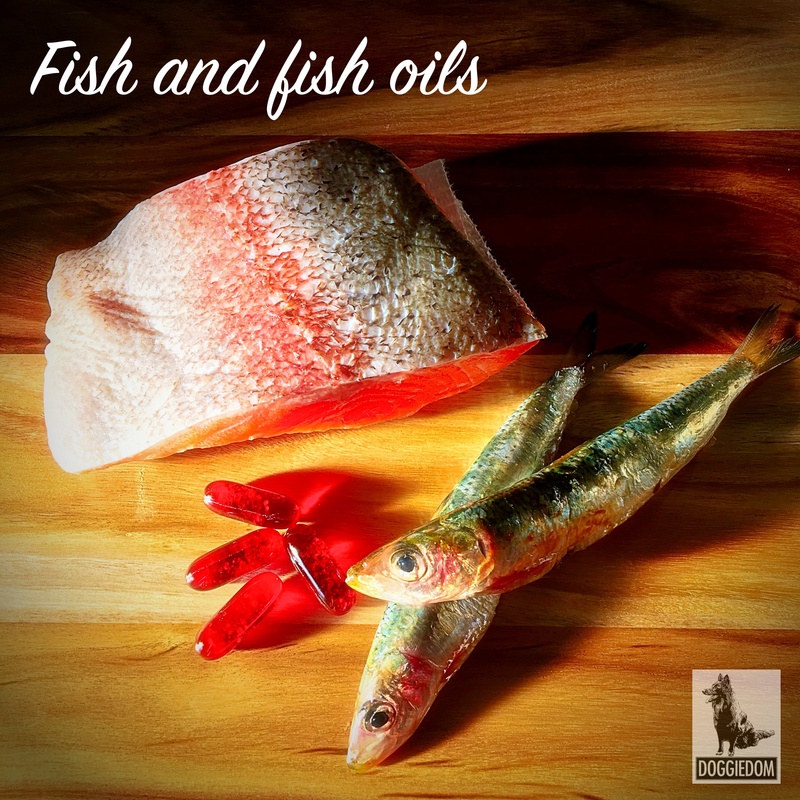 As if that wasn’t enough to grapple with, it also matters which types of Omega 3 and 6 are considered in this ratio; it is important to get a good balance of the plant and animal based oils. In addition to domestic farmed animals being generally much fattier than wild prey, their fat profile can be influenced by what they were fed; fully grass fed animals tend to have a higher Omega 3 content, while those on a lifetime diet of grain based foods have been found to have higher levels of Omega 6s. If you’re lucky enough to have access to wild, whole prey, the fat content and balance is likely to be the ideal for your dog (or cat’s) needs. But that is an option for only a few of us, particularly on a regular basis. Don’t give up though, there is a way through it all! Here’s some recommendations to help the rest of us do our level best to balance our pet’s meals using regular domestic sources of farmed meats. The first important step is to serve lean meats as the foundation for your saturated fats most of the time (no more than about 5-10% fat content). I appreciate not everyone can afford these pricer meats, but if you are going for cheaper cuts, try and trim off as much visible fat as possible. If possible, source meats that are organic or at least grass fed or grazed for maximum benefit. Alternate your meat sources, particularly poultry and red meat sources to achieve a good balance between animal sourced saturated and polyunsaturated fats. Limit fattier meats (lamb etc) to once a week, or if you can, remove as much visible fat as possible – for example on poultry take half the skin off chicken to reduce excess fat. Limit fattier organ meats such as tongue also as an occasional treat and remove any excess fats on farmed animal organ meats like heart. Avoid heating or cooking fats, particularly on grills or at high temperatures. Saturated fats are the most stable for heating (cooking with coconut oil or ghee are good options), but they all have a heat point that will lead to oxidation, which can result in free radical damage to the cells. 2. Supplement with a range of complementary fats for balance…. Add small amounts of supplement fats to suit the fat profile of the meat source you are feeding (see table below). Add either an oily fish (such as sardines or herring) alternated with a quality phytoplankton or krill oil to each day’s menu to get those important DHA and EPA Omega 3s. Here is a table with some of the fats I typically add to my balanced lean meat diets for my dogs when feeding farmed ruminant or poultry meals based on Steve Brown’s recommendations. The more novel protein sources I serve such as kangaroo, crocodile, rabbit and grass fed venison generally have a better fat balance similar to prey animals, so I rarely supplement with additional fats for these meats. I’d suggest rotating the types of supplements through the week rather than using the same ones all the time (in line with rotating your protein sources as well), as long as you are serving them with the correct meal types. Please don’t add them all at once! Less is definitely more with fats. I cannot stress enough these additional fats are not suitable for dogs with pancreatitis or liver problems – you should definitely seek the advice of your vet about feeding fats to dogs with these conditions. Phytoplankton Omega 3 EPA, DHA Any lean meat meal, alternating with oily fish Follow instructions for dosage. *I recommend feeding oily fish in moderation; many species contain an enzyme called Thiaminase, which splits Thiamine molecules and makes them inactive, risking Vitamin B1 deficiency. I also avoid most fish oils due to the challenges in processing and storing them for long periods, but if needed a good quality sustainably source krill oil is preferred. I prefer to alternate whole fish with a quality phytoplankton. **Hemp food products are currently not legal for humans to consume in Australia, however it is allowed for animal feed. * **There seems to be much debate in dog breeding circles that flax causes reduced sperm count in males, however there is currently no formal research I have been able to find to substantiate the direct link. 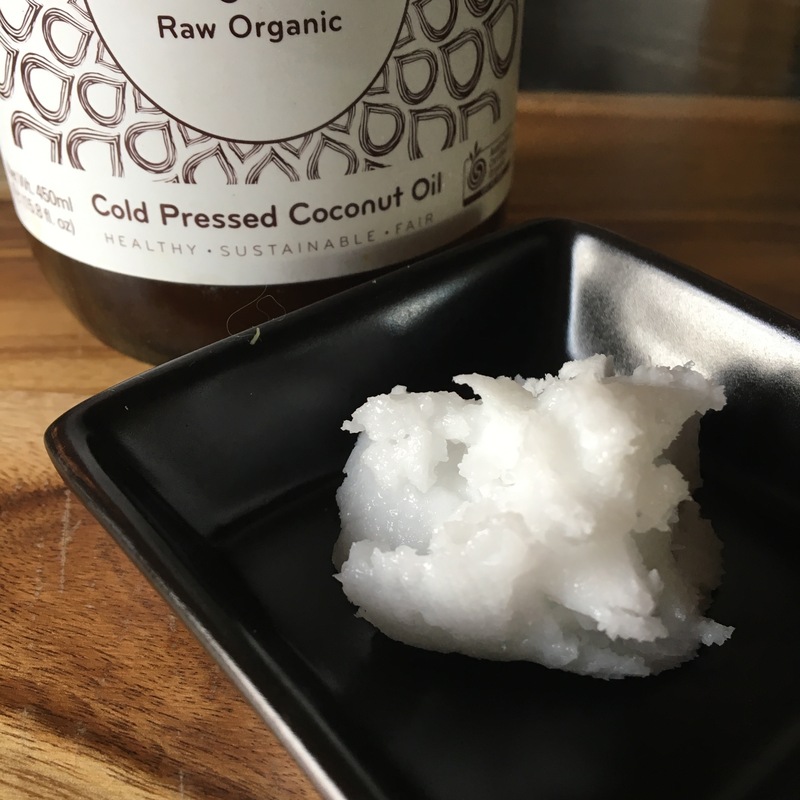 Okay, so you’ll notice I haven’t put in any coconut oil as a suggested daily additive – I know some doggie guardians are VERY passionate about using coconut oil every day, so I’m going out on a limb here! I’m very cautious about recommending regular doses of coconut oils for dogs because it is unclear from an evidence-based point of view whether it really offers the same sorts of benefits to dogs as has been discovered for people. Most of the research on coconut oils for dogs is patchy at best, and there are others that have shown that medium chain fatty acids, like coconut oil, are digested differently by dogs than humans, which means they are less likely to offer the same sorts of benefits. There does seem to be more substantiated information about its topical use on dogs for skin and parasite conditions, and there are limited studies that it could be beneficial for older dogs to reduce cognitive decline. More research in this area is greatly needed! Having said that, there is equally not a lot of evidence to suggest it is harmful to the average healthy dog. Aaaah – again no simple answer! For what it’s worth, my take on coconut oil is to use it for topical skin issues for your dog, and give it in moderation if your dog likes it, particularly for older dogs or those that are very active and can use the extra fat as an efficient source of energy compared to carbohydrates. I tend to offer it more as a therapeutic oil for my dogs rather than a daily supplement (more on that in a future blog!). Sometimes they will eat it alone to help with stomach upset. Other times they turn their nose up at it. Currently I’m looking into the value of feeding ghee to my dogs. Again, hotly debated and very little research on its benefits or otherwise for dogs. But ghee (the grass fed variety) – particularly if you are lucky enough to have it from raw milk or at least cultured – has a similar fatty acid profile to coconut oil, but has the added bonus of being rich in the fat soluble vitamins A, D and E. My dogs LOVE this stuff. Again, I give it sparingly as it is dense primarily saturated fat and substantially higher in the Omega 6s than 3s, so I consider what other foods and fats I’m feeding the dogs when I give it to them. Most of us have heard about the health impacts of hydrogenated and trans fats, which are essentially chemically altered polyunsaturated fats. These fats turn good oils into solids and are treated to prevent them from becoming rancid and are mainly found in a lot of processed goods, particularly fried foods and processed spreads like margarine (this refers to chemical by-product trans fats rather than those that can occur naturally in some foods). One of the biggest issues for dogs on cooked commercial diets however, is to consider the vulnerability of fats in these products (see my notes about storage below). There also tends to be an abundance of Omega 6 fatty acids, particularly in grain based foods. Due to the fragility of the PUFAs, it is also difficult to effectively supplement them in foods cooked at high temperatures without them turning rancid quite quickly – particularly the beneficial EPA and DHA Omega 3s. So I would suggest you avoid dog foods with added Omegas (particularly things like fish oils) as they will go rancid quickly once opened. Those that don’t probably have a great deal of preservatives to keep them stable, which could do even more damage to your dog’s health. If the fats go rancid or oxidise, it damages their structure and can lead to cell damage as they create free radicals – that means your dog is more susceptible to disease and accelerated ageing. Here’s some tips on buying and storing foods containing fats to prevent spoilage and compromising your dog’s health. Quality oils should generally be cold pressed, stored in sealed, dark class containers kept refrigerated. Keep seeds in cool dark areas and reduce exposure to the air. Do not heat or freeze fragile polyunsaturated fats or leave them exposed to air for too long before consuming – add them to meals just prior to serving. Don’t empty the contents from the bag into plastic containers – usually the packaging is designed to reduce oxidation so leave it in there! If you think you will keep it longer than a month, store in the fridge in it’s original packaging. So there are some of the basics about fats to help you make some decisions about what and how to include them in your dog’s diet. But there is so much more to cover on this fascinating topic – I haven’t even touched on cholesterol and its important role in brain health and behaviour, or even how fats can be used topically! But I’ll save that for another day…. In future blogs I will write more about the health benefits and risks of fats, including how they can be used therapeutically to address conditions and disease including allergies and cancers. Until then, just remember to keep those fats as healthy and balanced as possible in your dog’s diet! 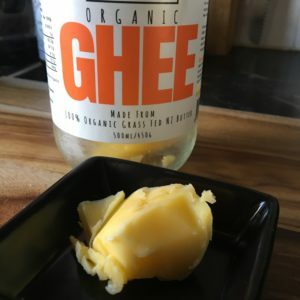 Axe, J, Are Ghee Benefits Better Than Butter?, https://draxe.com/ghee-benefits/ accessed 7 April 2017. Brown, S., (2010), Unlocking the Canine Ancestral Diet, Doggies, USA. Case, L .et al (2011), Canine and Feline Nutrition: A Resource for Companion Animal Professionals, Elselvier, USA. Concepcion, M, Coconut Oil for Dogs: Scientific Truth Behind the Miracle, https://nextgendog.com/coconut-oil-for-dogs/accessed 7 April 2017. Dwyer, B The Ultimate Dog Essential Fatty Acid (Omega 3, 6) Science Nutrition Guide, https://www.healthydogtreats.com.au/dog-nutrition/124-omega-3, accessed 7 April 2017. Julia Henriques, Balancing Fats for a Healthier dog (http://www.dogsnaturallymagazine.com/balancing-fats-for-a-healthier-dog/), accessed 7 April 2017. Dahlan, I & Norfarizan-Hanoon, NA (2007), Fatty Acid Profiles and Cholesterol Composition of Venison from Farmed Deer, Journal of Animal and Veterinary Advances, Vol 6, Issue 5, Page No. : 650-657. Middle, C (2007), Real Food for Dogs and Cats, Fremantle Press, Australia. Strazdina, V. et al (2012) Fatty Acids Composition of Elk, Deer, Roe Deer and Wild Boar Meat Hunted in Latvia, International Journal of Biological, Biomolecular, Agricultural, Food and Biotechnological Engineering Vol:6, No:9. Tariq, M (2015) Enrichment of Flaxseed for Developing Functional Rabbit Meat, Sarhad Journal of Agriculture, Vol. 31, Iss. 1, Pages 70-74 ( http://smithandfranklin.com/current-issues/Enrichment-of-Flaxseed-for-Developing-Functional-Rabbit-Meat/14/1/99/html#sexjj05BZ54irBYL.99).